This popular book is the only field guide to all of California's 130 freshwater fish species, both native and introduced. 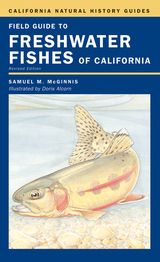 Revised and updated throughout, the guide now features the only complete collection of color illustrations of California freshwater fishes available anywhere. These color illustrations, coupled with a set of highly detailed black-and-white drawings, provide a quick and easy method for identifying fish in the field. Detailed natural history accounts for each species give a wealth of information, including the current endangered or threatened status of many native species.